The Chair Missal is arriving in a few months. Officially titled Excerpts from the Roman Missal, it will be available sometime between mid-March and the end of June, 2018. It contains only those texts from the Roman Missal that would be used by the priest at the chair so it is much lighter and easier for a server to hold. 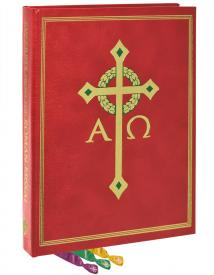 It is being published by a variety of sources, two of which the Diocese is getting special pricing through bulk ordering. Simply fill out the below form, hit the submit button and send a check to the diocese for the appropriate amount. If you order through the Diocese of Marquette with this form you will be getting a substanial discount (35%). Every attempt will be made to hand deliver your order. If you would like it shipped, you will be changed an additioanl shipping cost. Please contact Deacon Tom Foye if you would like your order shipped by calling (906) 227-9126 after this form has been submitted.